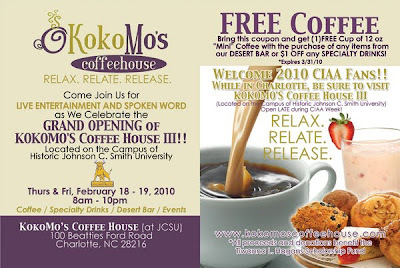 KoKoMo’s Coffeehouse is celebrating the grand opening of its new location on the campus of Johnson C. Smith University. The budding coffeehouse franchise was started by the late Tiwanna Hagans, who passed away last September. Hagans was a JCSU alum who dreamed of opening the campus's first coffeehouse, and before she died she was working hard to make it happen. The Uptown KoKoMo's location has recently closed, so hopefully this new one will carry on Hagans's legacy. The celebration is today and tomorrow and features live entertainment and spoken word poetry. For more details, visit www.kokomoscoffeehouse.com.